It’s the holiday season and most of us are looking for ways to simplify our hectic lives any way we can. Our customers are no different. Recently a customer was looking for a pallet flow solution to help them simplify their warehousing processes. It just so happens that this customer manufactures high-end, aluminum bakeware… and since it’s very likely that each of us had a product or two of theirs on our recent holiday tables, the Mallard team was more than happy to give this challenge some design time. 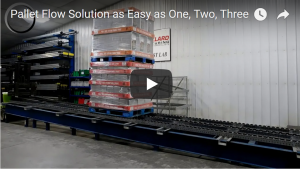 As you can see in the this condensed version of our Engineering Lab test video, the pallet flow lane configuration adequately handles each different type of palletized inventory… no matter the weight or the height which in some cases was double-stacked to nearly 8.5’. 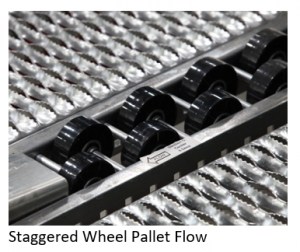 The pallet flow lane is comprised of 3 rails of Mallard polycarbonate wheels. The heavy-duty wheels are rugged and reliable for handling rigorous pallet loading and unloading. The wheeled rails alternate from 3”, to 2” staggered, to 3” centers in order to provide consistent coverage on the underside of each pallet, despite the weight variance, as it progresses down the lane. There are also drop-in speed controllers to assure a controlled and centered flow which is critical in all pallet flow jobs but particularly when working with double-stacked loads. The lane is completed with bolt-on ramp stops at the end to slow the pallet to a stop and hold it in the lane until removed by a forklift. There is the sense of accomplishment at the end of a well-prepared meal, just as there is one at the end of a well-prepared gravity flow solution. This customer now has a reliable and efficient warehousing solution to meet their many needs. What are your warehousing and distribution needs? Give the Mallard team a call to see if there is a gravity flow solution to simplify and economize your busy operation.